Hekab Be Biblioteca ~ Open Road Community Library: Gearing up for summer school 2008-- Sponsors needed! Gearing up for summer school 2008-- Sponsors needed! 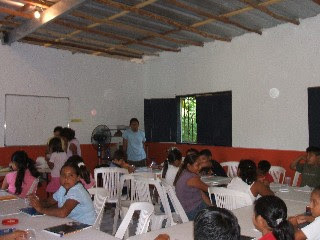 A classroom full of kids participating in the curso de verano 2007-- We expect to have as many as 70 children enroll this year! Well it's almost that time when school lets out, which means Hekab Be staff Maggie, Reyna and Gabina are preparing for their most intense teaching time of the year, the curso de verano or summer school. We anticipate having up to 70 children in three age groups: 5-7 year olds (beginning readers); 8-11 year olds (intermediate readers); and ages 12 and up (advanced readers). Hekab Be staff will be teaching the kids everyday from 9-1 starting July 14 for four weeks. 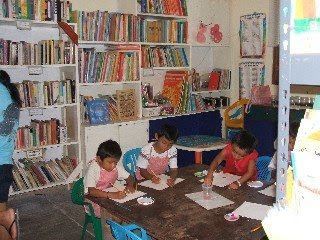 In past years we have always offered this service to Akumal's children completely free of charge. Because of the intensive nature of the summer program (we need to have at least 2 teachers working with each age group), in past years the summer program has drained our small financial reserves. Often we are not able to recuperate this loss before the year's end, as very few visitors arrive in the Fall. This year we are looking ahead realistically and making an appeal to all our library supporters and friends to ask if you can make a monetary donation to sponsor the summer program. Last year the summer program cost us about twice our normal monthly expenses adding up to about $2000 U.S. This donation is well worth it, because our summer program has consistently been an opportunity for kids to make great leaps forward in their reading skills. --A circus put on by the children on Akumal's stage. The musician Ray Ortega will be returning to help put this circus together and the preparation for it will include music and arts instruction as the kids learn how play instruments and prepare props for the performance. Musician, Ray Ortega, giving a drum presentation during last year's summer course. --We will also be hosting a reading competition with prizes for each age group for the child who reads the most books during the summer program. --And as always, at the end of the course, there will be a big bash to celebrate the kids' accomplishments!